New crop circle at White Sleet Hill, Nr Mere, Wiltshire. 25th June. Six key circles surround a seventh circle in the middle. Eighteen circles provide an outer ring. The farmers are lucky to have such massive lands, i wish i could own a land there. I have said before i want to purchase a land in Wiltsire..but i doubt there is any available, people want lands there but they cant get it. Now that's a Freiking awesome circle. Could this be a sign of the impending planet with its 6 moons heading our way in 2012? For those of you who believe “Crop Circles” are created by extraterrestrials I have a question. Why do you think wheat fields are their canvas? Why not an ash fault parking lot? Why not any other surface? There are a lot of mysteries out there but crop circles are a joke and maybe just disinformation. 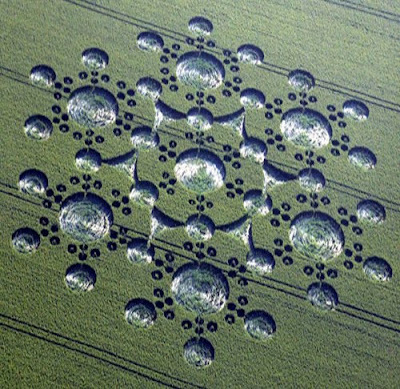 When a crop circle does not have any lines that run through it (such as done by a seed planting mechanism, or by a plow, etc.) then I'll consider it a possible real honest to goodness alien-made crop circle. These crop circles that pop up with lines running through them are not impressive, to me, because it's been shown again and again that humans can create these (even intricate ones) in pretty short time; they just need some kind of foot access to the location they choose to make these circles; and well, all crop circles that have these plow or seed sowing lines that run through the crops provide people with trails (that when used do not appear as obvious because they do not disturb the site beyond the circle design). Whether or not a given crop circle is an honest to goodness alien-made crop circle or not - if a crop circle has lines running through it; just the question 'whether the lines may have been used by humans or not' calls the crop circle into question. Show me a crop circle that does not have any disturbed plants around it or through it (especially in crops that humans can not easily navigate through without disturbing the crop, i.e. wheat, rye, etc. ); then you will have peaked my interest. perhaps the ufos are eating the crops, gradually getting bolder, and if this eating process grows exponentially it will eventually wipe out the human food supply. 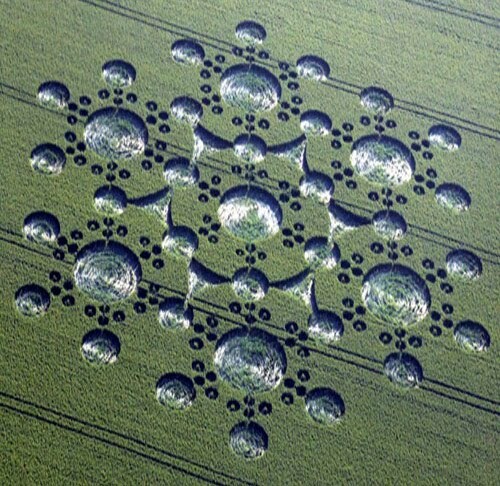 the geometric patterns may simply be due to creative harvesting methods or the machine processes used to gather the crops, or to gather the life force from the crops. perhaps the physical plants are not completely destroyed. Interesting so many people think its fake Id like to hear what they base that on. Well, I think the doubters are just that way no matter what, the Lord says "Signs follow those who believe", not "you shall see a sign and believe". It takes a little faith bros. I agree, unified feild theory. Fractal!